The National Nutrition Committee held in Vientiane on Nov 2 the 3rd Nationwide Meeting on Nutritional Affairs and the National Nutritional Committee’s Meeting 2017. “Nutrition is among 10 priorities to which the government of Laos has attached importance. The government has approved the establishment of multi-sector collaboration mechanisms which have been improve periodically, increased budget injection and mobilized supports from various sectors, both domestic and foreign, for the implementation of this duty,” said Deputy Prime Minister and Chairmand of the National Nutritional Committee Mr Sonexay Siphandone. Reports by the Ministry of Health and the Secretariat of the National Nutritional Committee suggest that the nutritional status of mothers and children in the Lao PDR has been improved with the chronic malnutrition (stunting) among under 5 children reduced by around 10% over the past four years from 44% in 2011 to 35.6% in 2015. “The data reflects that the Lao PDR’s efforts have been made in the right direction. Besides to achievements made and the objective we are going to achieve in the future, there are numerous challenges which means we still have a major task to fulfill to ensure that Lao children across the country enjoy better nutrition,” said Mr Sonexay. The participants of the meeting were reported about the progress various sectors have made over the past one year in implementing nutritional strategy and programmes and presented planned efforts for 2018 and beyond. Representatives from provinces also reported about the implementation of the national nutritional plan of action which takes a “convergence” approach, combining 22 priority interventions from the agricultural, health, educational and WASH sectors, as well as collaboration between relevant sectors, challenges and solutions. Representatives of Scaling Up Nutrition (SUN) Movement – SUN Lao PDR, a nutritional promotion network grouping together European Union delegation to Lao PDR, World Food Programme, UNICEF, and civil society organizations have called on supports for the implementation of the national nutritional strategy 2025 and plan of action 2016-2020. 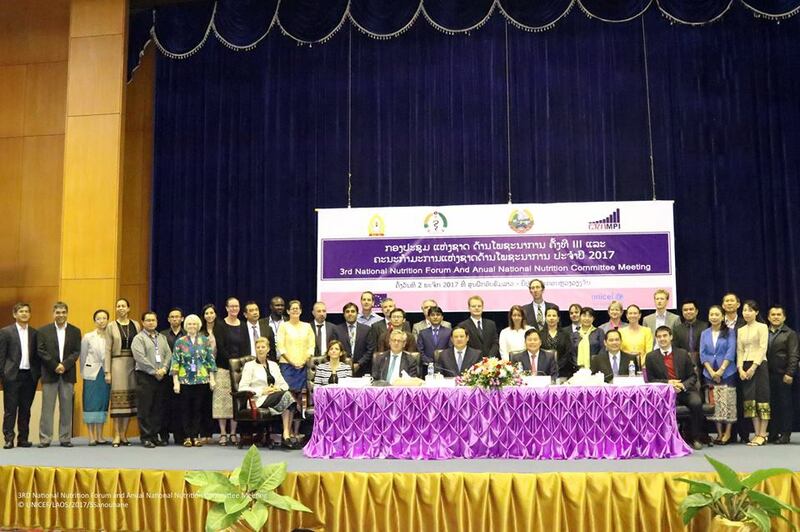 The meetings were attended by Minister of Health Bounkong Sihavong, vice provincial governors, vice Vientiane mayor, members of national nutritional committee, and representatives of international donors and stakeholders. © 2017 SUN Civil Society Alliannce Laos. All Rights Reserved.